The promotion of our ski club was the main objective of our “World Snow Day”. 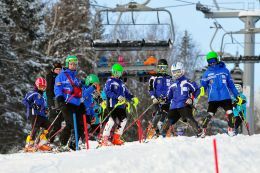 More specifically, we wished to give the opportunity to children and their parents to try ski racing for the first time. We set up a duel course in an easy (green) trail. Because the trail was left open to the public on the left hand side (looking downhill), we decided to isolate the course using “stubbies” on the right to prevent any collision. Our 20-turn course with start gates and a finish line allowed children to duel each other. Parents and bystanders were also welcome to use the track. In a friendly and festive atmosphere, coaches and volunteer parents from the club were helped calling the starts, ensured safety and encouraged participants throughout the day. Our “World Snow Day” event also included the presence of a promotion kiosk in our main dining hall. The kiosk displayed a projection of skiing videos from our racers as well as information about our racing activity and our year-round racing schedule. This kiosk acted as our main recruitment point during the event. The volunteer parents at the kiosk could communicate via CB radio with the coaches on the course track to send them children who wanted to try racing. 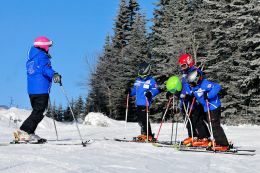 A total of 15 children tried a full day of training with our ski racing club. It may seem small, but considering the fact that our effectives is currently at 33 children, its a total addition of 45%, thus a substancial increase. Children and parents both tried the course and enjoyed challenging each other. Including parents, coaches, bystanders and “registered” participants, we had a total of a 100 people involved in the event. Considering that our objective was of increasing our number of members and to give children a chance to race in a safe environment, we can definitely say that our “World Snow Day” event was a successful adventure. We hope to help even more people to discover our sport next year!